PBR - This should be obvious to even the most casual of fans, but the best team in baseball does not always win the World Series. In fact, since 2000 only two teams have led the majors in wins and gone on to win the World Series - the 2009 Yankees (103) and the 2007 Red Sox (96). If you haven't yet I encourage you to take a look at my recent article about using mathematics and specific metrics to compare clubs across generations. True, winning the World Series is a major accomplishment, but a champagne-covered trophy and a parade are not requisites for greatness, nor do they guarantee a spot among baseball's all-time elite. Not taking anything away from San Francisco, but do we firmly believe the Giants were the best team in baseball this year? Yes, the club may have been the "best" in the sense that they performed better than anyone else following the regular season, but were they the most talented club in baseball this year? Put another way, did the team with the greatest statistical ability win the World Series? The Greatness Number ranks the Giants as the 11th best club in the majors this season, meaning ten other teams were statistically stronger (NYY, WSH, TB, TEX, StL, ATL, OAK, CIN, LAA, CWS). If you ranked clubs by win totals the Giants ranked sixth. It's a fact that the best team (statistically) rarely wins the World Series. Probability and chance variability play a significant role in determining the outcome of a playoff series. 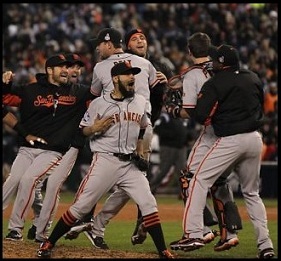 Knowing that, take a look at how the Giants compare to World Series winners dating back to 2000. The clubs are ranked according to their Greatness Number - the number is parentheses is the club's rank in baseball history. This list provides context as to where the 2012 Giants belong in baseball history. Of more than 2,300 clubs the '12 Giants rank 654th, good enough to belong in the top 30% but nowhere need good enough to belong in the discussion of an all-time great club.